He is the founder and former music director of “Casalmaggiore International Music Festival, Summer Music in Italy”. He was also founding member “Trio Tre Musici” (Milan), Chamber Music Chicago, Le Groupe Baroque de Montréal, Vienna Academy String Quartet and the Gabora String Quartet. 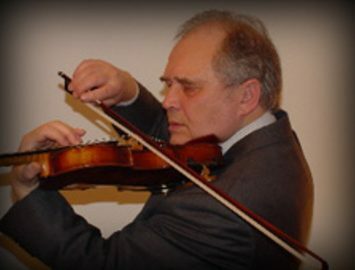 He was professor of violin (emeritus) at the Oberlin Conservatory of Music, McGill University (Montreal), Conservatoire de Montréal, St. Louis Conservatory of Music, University of British Columbia and the Vancouver Academy of Music. He gives master classes in major music institutions in the world including Beijing, Seoul, Tokyo, Hong Kong, Los Angeles, Oberlin, Mainz, Montreal, Toronto, Milan, etc. In 2011-2012 he gave master classes at UCLA (Los Angeles), the Unversität für Musik und Darstellende Kunst (Vienna), Academy of Music (Odessa, Ukraine), McGill University (Montreal), Gutenberg Universität (Mainz Germany). Taras Gabora frequently represents USA and Canada on juries of national and international competitions including the Tchaikovsky International Competition (Moscow), Paganini International Violin Competition (Genoa), 1989, 1996, 2001, the Sarasate International Competition (Bilbao, Spain), 1989, 2003, 2011, the Ifrah Neaman International Violin Competition (Mainz), the Yenkelevich International Violin Competition (Omsk, Russia), the Whitaker International Competition (St. Louis, USA) and others. Numerous prize-winning students in national and international competitions studied with Taras Gabora. These include the Paganini Competition (Genoa), the Montreal International Competition, the Scheveningen International Competition (Netherlands), the Tchaikovsky Competition (Moscow), the Yuri Yankelevich International Violin Competition (Omsk, Russia), Jacques Thibaud Competition (Paris) and others. Several of his students are members of internationally known string quartets such as the Shanghai, Molinare and Alcan Quartets, many are professional orchestral players in many parts of the world including the First Concertmaster Los Angeles Philharmonic Orchestra. Former students are on the faculties of University of Southern California, Los Angeles, Manhattan School of Music, New York, University of Arizona, McGill University, Montreal, Conservatoire de Montréal, University of Manitoba, Kent State University, Ohio.